This month's photos show the consignment of parts from Sheffield on site at Bridgnorth. 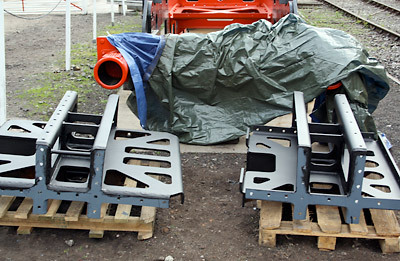 There is some work to do before they are fitted to the chassis of the loco, not least of which cleaning and painting. It is a lot easier to paint into awkward recesses when the component can be turned over or on to its side before being fitted into position. Machining of the frame keeps continues. The fitted bolts for the radial arm support stretchers are now to hand which will enable work to progress on these items. During the summer of 2009 we obtained a quote for the fabrication of the smokebox saddle. However insufficient finance was available for this item at that time and we did not have the drawing for the exhaust steam pipes which are an integral feature of this construction. We now have that drawing and are seeking an updated quotation in the hope that we can place the order in the near future. Warwickshire-based artist Kevin Parrish's painting Standard Splendour, featuring 82020 at Machynlleth in the 1960's, is now available as an attractive A3-sized limited edition print on lumi silk paper. Price is £25.00 including postage and packing (in a tube). Prints are available from Chris Proudfoot at Woodford, School Bank, Norley, Cheshire WA6 8JY, telephone 01928 787255, email chris.proudfoot045@btinternet.com. Total print run will be limited to 750, initial run to just 10, so hurry up and get your orders in, in time for Christmas! Help 82045 and win a footplate ride! 82045 members and potential new supporters will be entered into our free annual draw to win a 32 mile footplate ride on the Severn Valley Railway. To qualify for entry, members are required to contribute a minimum of £5 per month by standing order or be 'lifetime' members. Full details of this and membership/ standing order forms may be found on the How to Help page. Please remember that you can help us build 82045 and it won't cost you a penny. When you shop or buy insurance, use the Easy Fundraising website on our How to Help page and we will receive donations from the traders you use. Barbara and Tony recently bought house insurance by this method and 82045 received £45.00........SIMPLE! 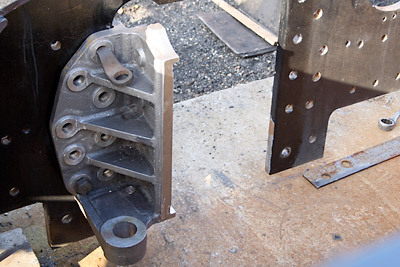 The two hornblocks for the centre axle. 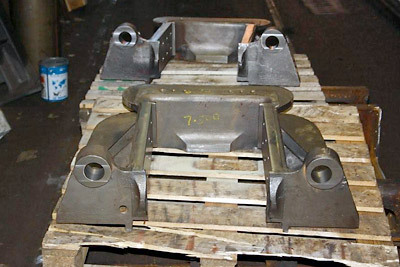 One of the horn guides for leading and trailing axles offered up into position on the frames. Trailing pony truck centre/frame stay and leading pony truck centre/frame stay. Standard Splendour, by Warwickshire-based artist Kevin Parrish.